I have chosen this name for this blog because it truly states my story. I am a type II diabetic who most certainly enjoys food. When I was diagnosed with diabetes several years ago, my blood sugar level was over 400. With some oral medications, a lot of research and some trial and error, I have found that unlike my ancestors I truly can continue to enjoy food. I hope this blog will help you to also enjoy food and be healthy. Some recipes are my originals and some I have collected. Everyone reacts different to various foods. Check your blood sugar readings so you will know whether or not a recipe works for you! And feel free to take a recipe and adjust it to suit your needs. Coat a large skillet with the nonstick cooking spray over medium-high heat. Add the asparagus to the skillet, cover and cook for 8 minutes or until tender and lightly browned. Remove asparagus from the heat and sprinkle with the Parmesan cheese, salt and pepper. Toss to combine. Note: This recipe is basically from an old Diabetic Cooking Booklet. I saw this recipe on facebook. 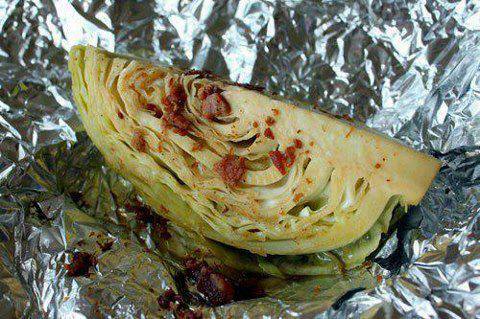 Since cabbage is one of my favorite vegetables I wanted to try it. It is a good healthy way to make a side dish! Preheat the oven (or the grill,) to 425 degrees. Prepare the cabbage. Rinse it under water and remove any yucky loose leaves. t the head in half on the core..
Then cut the halves in half again……to make quarters. Wrap each wedge and bake for 20-30 minutes. I say 20-30 because they will continue to cook once you pull them out and I like mine still crunchy. So I let them sit for a little while pull them out around the 20 minute mark. However, some like to cook them up to an hour for softer cabbage. 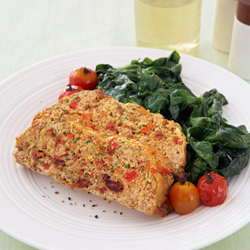 The wedges reheat wonderful in the oven or the microwave! Cook the pasta in a large pot of boiling water approximately 9 minutes until al dente. Reserve 1 cup of the pasta water and set aside. Drain pasta and rinse*. Heat a large skillet over medium heat; add the shrimp and wine. Cover and cook 1 to 2 minutes until the shrimp are pink and opaque; remove to a bowl and set aside. Heat the oil in the same skillet over medium-high heat. Add onions; cook a couple of minutes until translucent. Add the garlic, and red pepper flakes; cook, stirring 1 to 2 minutes. Stir in the kale and salt. Add the reserved pasta water and cover skillet. Cook about 3 minutes until the kale is wilted. Toss the pasta, shrimp, and kale together then dish into serving bowls. Garnish each dish with the Parmesan cheese and serve immediately. Note: This is my version of a basic recipe from an old Diabetic Cooking magazine. In a large nonstick skillet, over medium heat, melt the brown sugar blend with the butter, curry, and cumin; cook, stirring, for a minute. Add the carrots, salt, pepper, and water. Cover skillet and bring to a boil; reduce heat and simmer 7 to 8 minutes or until carrots are tender. Remove lid from skillet and simmer briskly, stirring often, for about 5 minutes until the liquid is reduced to a couple of tablespoonsful. Sprinkle with the parsley. Note: I suggest serving this as a side dish to a lean protein item. I am not so sure about this recipe as it is mostly dairy which might be a little too much for some diabetics. However, I am posting this that I got from a friend. I am neither recommending nor not recommending this as I have never made it. "This one is a WINNER!!!! For when you absolutely want pizza but not all the carbs!!!!!!!" Squeeze the orange juice into a shallow dish; add Worcestershire sauce and stir to blend. Add the pork chops to the mixture, turn to coat both sides, cover and refrigerate for 30 minutes up to 2 hours. Remove the chops from the marinade to a plate and sprinkle with the Italian seasoning, pepper, and salt. Heat the oil in a large skillet over medium-high heat until hot; add butter. When butter has melted, add the chops and cook on each side about 5 minutes or until cooked through. Sprinkle with the chives before serving, if desired. Place the beans and water in a large cooking pot or Dutch oven. Bring beans to a boil; reduce heat and simmer 10 minutes. Turn off the heat but allow the beans to sit covered for 1 hour. Drain beans and rinse. 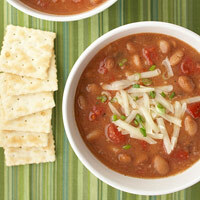 In a crock pot or slow cooker combine the drained beans, broth, onion, water, garlic, cumin, and cayenne pepper. Place lid on cooker and cook on low for 8 to 10 hours or on high for half that time. Remove lid and add the tomatoes; cook for another 30 minutes. To serve, dip into serving bowls and garnish with the cheese and/or cilantro, if desired. Serve with crackers, a crusty bread or corn bread. Note: I got the basics of this recipe from a diabetic web site. But this is a good healthy dish for anyone. *I got the original idea for this tart from a diabetic recipe website (I believe it was EatingWell). I have made some changes that I think make it healthier. Walnuts and blueberries are two of the healthiest foods and are especially good for diabetics. Coarsely chop the walnuts in a food processor; add Graham cracker crumbs and process until the mixture is fine crumbs. In a medium bowl, whisk the egg white until frothy; add crumb mixture, butter, coconut oil, and salt - if using. Toss the mixture to combine well. Press onto the bottom and 1/2-inch up the sides of a 9-inch tart pan that has a removable bottom. 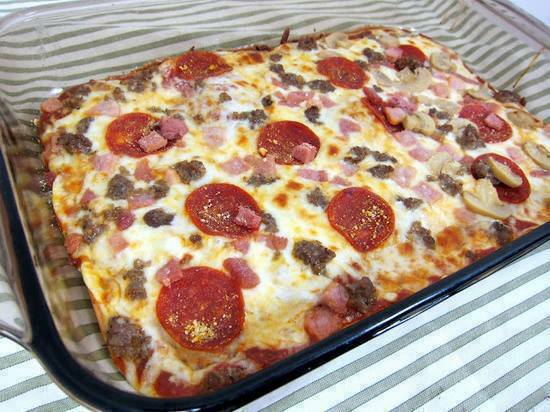 Set tart pan on a cookie sheet and bake at 325 degrees for 8 minutes or until dry and slightly darkened around edges. Remove from oven and allow to cool on a wire rack. In a mixing bowl with mixer on low speed, beat the cream cheese, sour cream, and 1/4 cup of maple syrup until smooth. Carefully spread the mixture into the cooled crust. 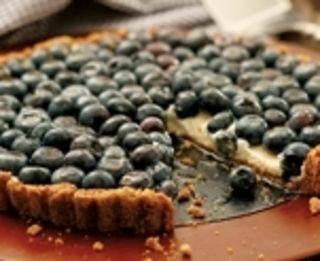 Place the blueberries over the filling and drizzle with the remaining two tablespoons of maple syrup (I omit this syrup). Refrigerate at least an hour before serving. Can be made 1 day ahead and refrigerated. **If you have serious problems with your blood sugar, use sugar-free maple-flavored syrup and use sugar-free vanilla wafer crumbs instead of graham cracker crumbs. As always, remember this is a dessert. Eat one piece and share the rest with family and friends. In a large mixing bowl combine the barbecue sauce, mustard, and honey; reserve 1/2 cup of the sauce. Cut in large tenders in half lengthwise; place all chicken in the bowl of sauce to marinate. Stir to coat, cover and refrigerate for approximately 1 hour. Spray a large baking sheet with sides with the cooking spray. Combine the flour, pepper, and salt in a shallow dish or pie plate. Beat eggs in a second shallow dish or pie plate. Place bread crumbs in a third shallow dish or pie plate. Place chicken on prepared baking sheet and coat each side thoroughly with the cooking spray. Bake chicken at 450 degrees for 10 minutes. Turn and bake another 10 minutes or until crisp and cooked through. I have had this recipe for years. I believe I adapted if from a Joy Bauer recipe. As anyone who reads my blogs regularly knows, I simply do not allow poultry into my mouth. I know, it is a quirk I have no intention of trying to overcome! However, I do realize that many of you live for chicken and turkey so I am posting this recipe from Joy Bauer for you. But please remember to read the label on your ground turkey. If the product contains skin it is not in your health's interest to purchase it. This is my granddaughter holding the Apple Pecan Loaf Cake she made for a friend's birthday.